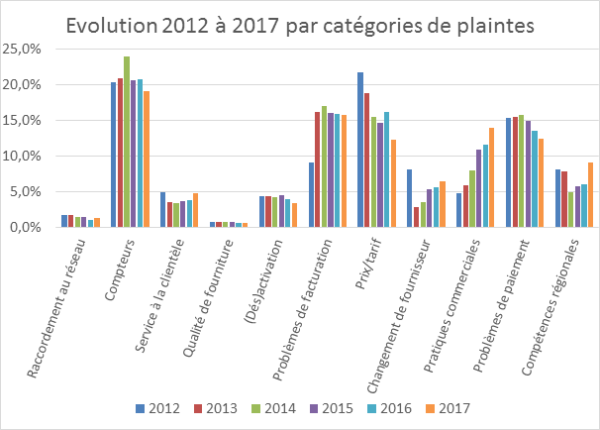 In 2017, the Federal Service for Energy Ombudsman received a total of 5,797 complaints (5% more than in 2016 and 37% more than in 2015), of which 65.6% were complaints in Dutch, 34% in French and 0.4% in German. According to the Ombudsman Service, this steady increase in the number of complaints since 2015 can be partly explained by the higher amounts of energy bills, but also by certain dubious market and sales practices, which are becoming more and more common. The other complaints concerned issues related to the supplier switching (6.4%), the quality of the services (4.7%) and certain regional skills (14.2%), such as the connections and power outages, the green electricity, public service obligations and the distribution network tariffs. Finally, the Ombudsman Service continues to advocate for a uniform and understandable energy bill, so that customers (residential and businesses) can better evaluate and compare agreed and billed prices, tariffs and discounts. The Energy Ombudsman Service will publish further information on dispute resolution, recommendations for each energy company and policy advice in its annual report, which will be submitted by May 2018 to the Federal Minister for Energy and the Parliament.